If you love the theme music in a movie and want to play it on your music players, Easy Audio Extractor is definitely your right choice. With easy-to-use interface, ultra-fast extracting speed and rich audio formats support, Easy Audio Extractor helps get amazing music from video to enrich your leisure time. 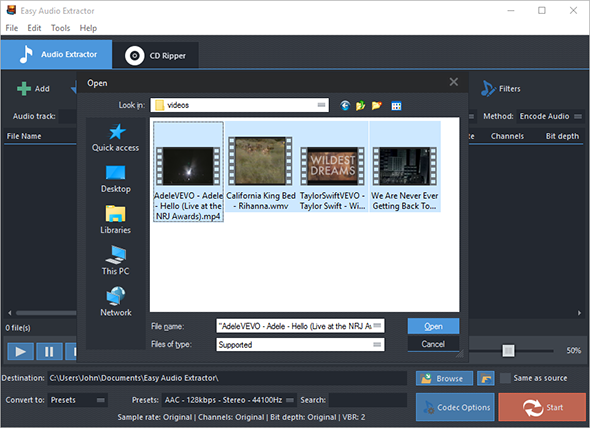 Click “Add” and 3 ways can be applied to add video file: “Add Files” is for one or more video files; “Add Folder” is for the folder containing video files; “Add Folder Tree” is for the folder along with its subfolders. To delete them from the list by “Remove”/”Clear”. Tips: All the files will be listed in order of input by default. If you need to arrange the files in order, just use the “Up” & “Down” buttons to move it up and down in the list. In the menu of “Convert to”, select one conversion type from “Presets” and “Codec”. If “Presets” has been chosen, you will see a whole list of quality presets in the dropdown menu of “Presets”. Choose the one that best suits your needs. To adjust codec settings, click “Codec Options”. To specify effects and filter settings, click “Filters”. 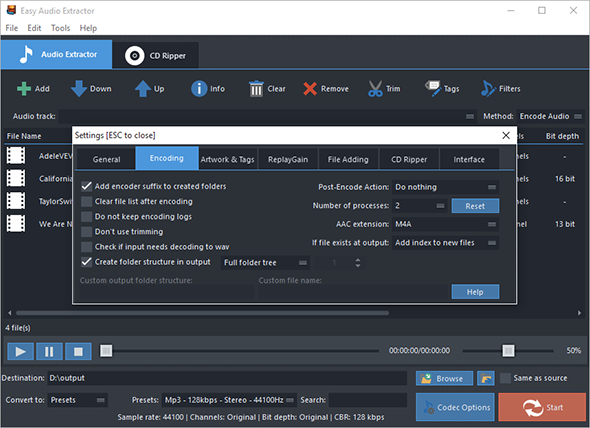 After that, click “Browse” to choose an output folder for the converted video files or check “Same as source” to save them in the source folder. Now, start audio extraction by clicking “Start”. After conversion, you can click “Open” to open output folder to find the converted files. Interface – make the app always on top, show extra columns in file list and show text in toolbar buttons.